Please join us for the BWUFA Annual Mount Vernon Slave Memorial Wreath Laying Ceremony on October 6, 2018 at George Washington's Mount Vernon. The Slave Memorial Wreath Laying Ceremony starts promptly at 11:00 a.m. This event free to the public. VIP guests must contact BWUFA for special entry instructions 703-477-4793. 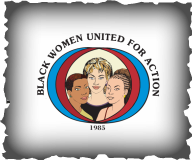 ​Black Women United for Action (BWUFA) is a diverse, volunteer, non-profit community service organization whose mission is to advocate the concerns of women and improve the lives of impoverished, vulnerable families through a self-sufficiency/empowerment approach. By utilizing combined talents, BWUFA seeks to provide a variety of community programs and support services through a grassroots "hands-on" method to create positive change.